File this one under: Why didn’t we think of that? Ikea in Russia, with the help of its agency, Instinct, have created the first-ever Instagram website to promote its new PS 2014 Collection. 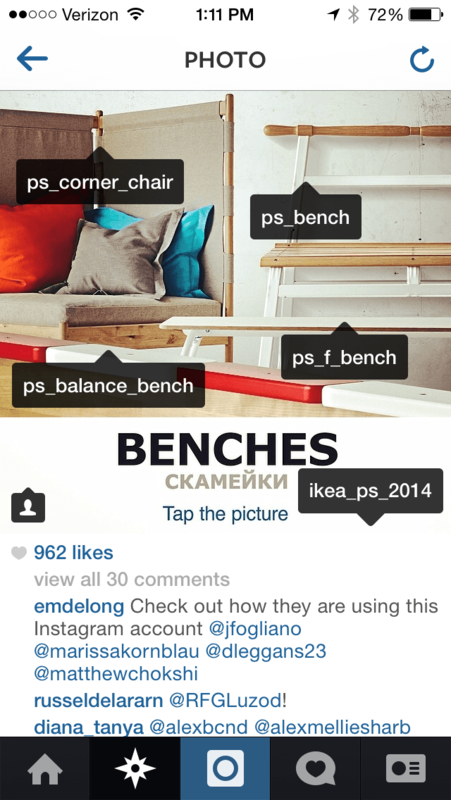 Designed for mobile users, the website lives on Instagram through the @ikea_ps_2014 handle. Clever tagging and a multitude of handles associated with products in the PS 2014 collection mimic a traditional website experience within the Instagram app. 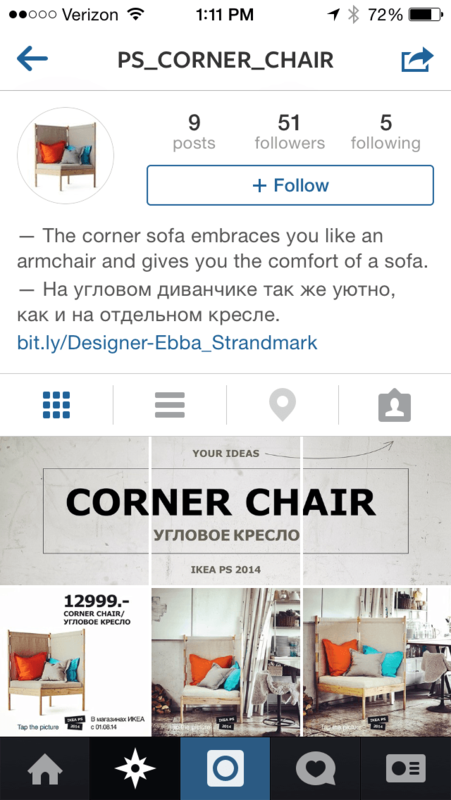 In order to best experience this campaign, take a few minutes to explore the @ikea_ps_2014 handle on Instagram. Note: If you open the experience on a desktop computer, it doesn’t work. 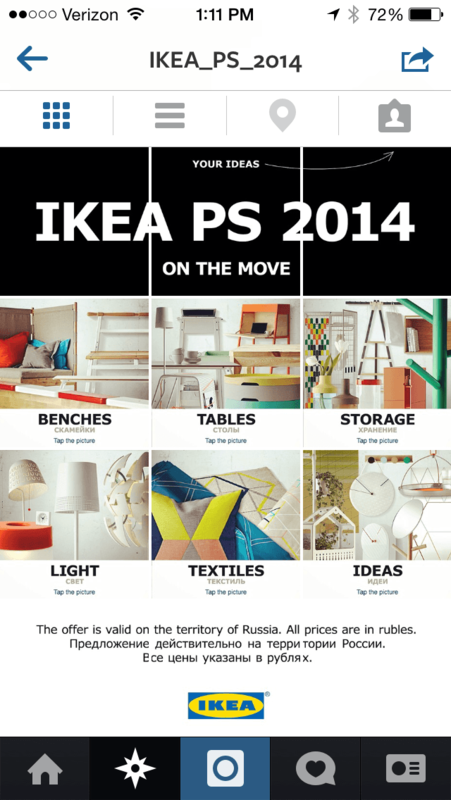 As seen below, the @ikea_ps_2014 account serves as a campaign landing page and showcases different product categories, from benches, to tables, storage, light, textiles and ideas. Click on a specific product category to dive in deeper. By tapping the image, a handful of product names pop up in black. If you click on one of the product names, you are transferred seamlessly to a dedicated Instagram account for that product, which includes price, product specs, plus lifestyle images of the product. There is also a link for more information about the product’s designer. Once on a product page, it’s easy to go back to the original @ikea_ps_2014 handle. 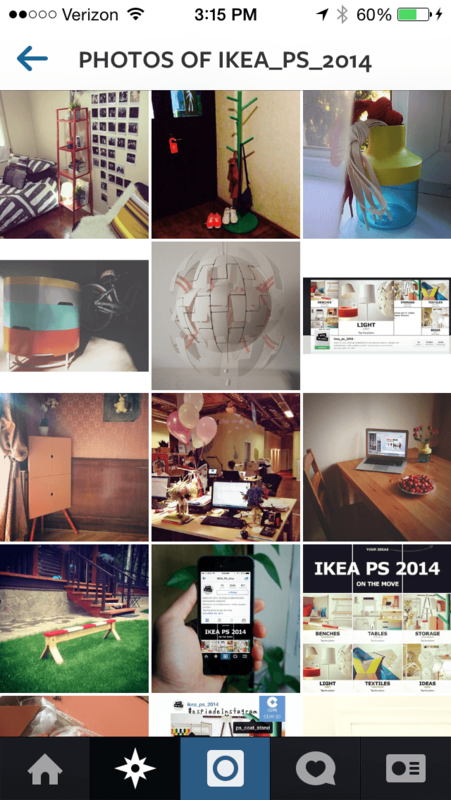 After browsing, fans are also invited to submit their own ideas by tagging @ikea_ps_2014 in their own Instagram images. What’s smart about this campaign is how seamless the user experience is. It solves for a common problem on Instagram of not being able to click on links, which is necessary for e-commerce or a web catalogue experience. The Instagram “websites” are easy to explore and find information about the new product line quickly. If anything, there could be more examples of lifestyle images further down on each Instagram page to serve as visual inspiration in someone’s home. It would have been nice to see each product’s Instagram account bio have a link to the specific product on Ikea’s website, versus the designer. Although it is nice to know who the designer is, this could be featured prominently on Ikea’s website, in addition to options to purchase the item. From an e-commerce perspective, it would be incredibly valuable to use this campaign as a test to understand the power of Instagram to drive purchase. This would be measurable and help showcase if there’s value in replicating this campaign across other product lines or countries in the future. Although not the focal point of the campaign, the concept of encouraging users to submit their ideas by tagging @ikea_ps_2014 in their own Instagram images offers a strong opportunity. Crowd-sourced product wish lists could help inspire future collections, or provide feedback on current ones. The team could also consider building a deeper relationship with these fans, from hosting fan experience days at an Ikea store, to surprising them with Ikea merchandise or exclusive news on new product lines.